In the pre-colonial times and before the advent of the regular courts, Nigerians had a simple and inexpensive way of adjudicating over disputes amongst themselves. People are referred to elders or a body set up for that purpose. The practice has over the years become strongly embedded in the system that they survive today as custom. Arbitration and Alternative Dispute Resolution (ADR) basically refers to all the ways and methods of resolving disputes outside of the formal judicial process or litigation. It is a collective term for the ways that parties can settle disputes, with (or without) the help of a third party. Following developments in other fields—like medicine—and trends globally, alternative dispute resolution, ADR, has gained widespread recognition and acceptance in Nigeria. As a form of dispute resolution, it encompasses traditional commercial dispute resolution modes in the form of arbitration, mediation, negotiation, conciliation (often considered a part of arbitration), and collaborative law or hybrid legal processes. Historically, Alternative Dispute Resolution is of two types. The first one refers to the methods of resolving disputes outside of the official judicial mechanisms. It is a regular feature of the customs of the peoples of Nigeria. The second encompasses various informal methods attached to or pendant to official judicial mechanisms. Today, mediation in Nigeria has developed into a more structured process and within a legislative framework. Mediation continues to be a tool in Nigeria for the resolution of disputes in an amicable manner at less cost usually on a win-win basis and with the benefit of face saving. Mediation encourages the restoration of the relationship of the parties and avoids it being prejudiced by a “battle” before a court or tribunal with power to impose a decision. 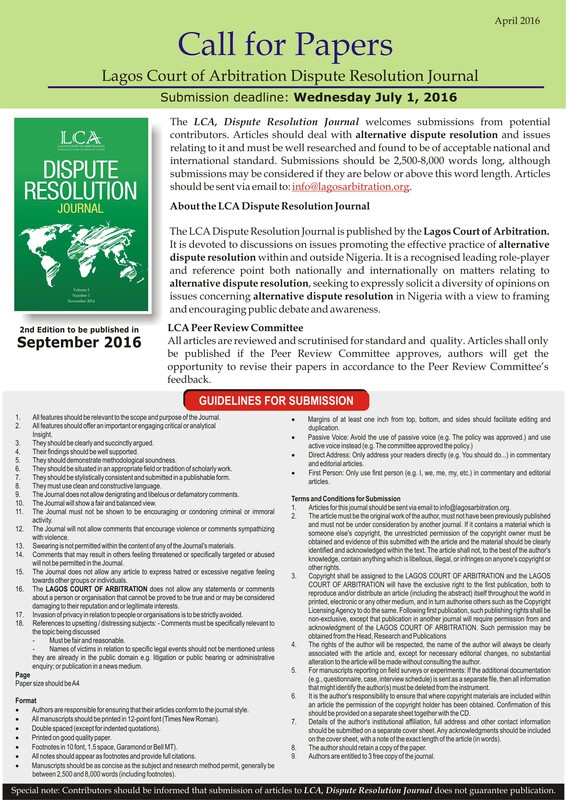 The Lagos Court of Arbitration (LCA) was founded in 2009 in response to the need to create a new and modern legal framework for the resolution of commercial disputes in Nigeria and the West African region.